Gum disease, or periodontal disease as it’s called by your dentist, is one of the most common oral health concerns affecting US adults. In fact, studies indicate that as much 50% of adults over the age of 30 struggle with some level of gum disease. After the age of 35, that percentage goes up to 80%, and for adults in this demographic, gum disease is the leading cause of tooth loss. Additionally, gum disease has been linked with numerous whole-body health concerns, including heart disease, diabetes, and pre-term births. With statistics like these, it will come as no surprise that the Anderson Family Dental team takes prevention of this oral health condition very seriously. We screen for early warning signs of gum disease during every dental checkup, and we provide a variety of periodontal therapies to renew oral health and avoid the risks to your health that come with gum disease. If you want to learn more about periodontal disease, please contact us to schedule an appointment in our Gahanna dental office. 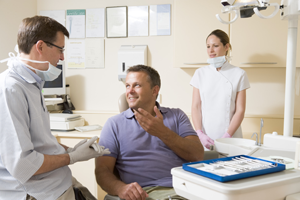 You can also feel free to ask about our periodontal screening during your next dental checkup. Periodontal disease occurs when plaque and tartar buildup accumulate at or below the gum line. When this happens, the soft tissue can be irritated, infected, or inflamed. Without treatment, the soft tissue and supportive alveolar bone tissue that holds your teeth in place begin to deteriorate. This allows your teeth to move in their sockets and can eventually lead to tooth loss. Additionally, the accumulation of plaque and tartar that leads to gum disease can also cause tooth decay, so many patients need to treat both the decay and the gum disease to ensure effective results. There are two stages of gum disease. In the early stage called gingivitis, the symptoms are very mild and can go unnoticed by patients. Gingivitis is typically treatable and can be completely cleared up. In the more advanced stage called periodontitis, gum disease becomes a chronic illness that you will need to treat for the rest of your life. Is Gum Disease Cured after Treatment? Not usually. For patients with very mild gum disease, gingivitis, we may be able to completely renew your oral health. However, advanced periodontitis is a chronic illness. Like other chronic disease, it will need to be monitored and treated for the rest of your life. With proper care, you should not have to worry about the adverse oral and overall health effects associated with gum disease, but you will need to be on your guard against these health concerns for the rest of your life.